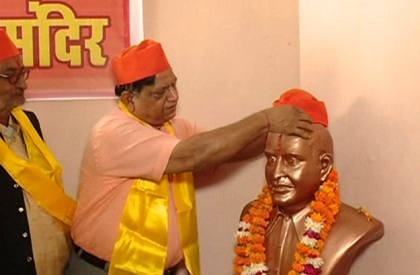 BHOPAL: The Akhil Bhartiya Hindu Mahasabha has set up a temple for Nathuram Godse in Gwalior. Godse who had assassinated Mahatma Gandhi, was later convicted and hanged for the crime. The Mahasabha has installed his idol and begun prayers. The Godse temple is located in Hindu Mahasabha office in Gwalior. The Opposition has condemned the decision of the Mahasabha to build the temple. It has demanded stern action. Home Minister Bhupendra Singh told media persons that he was not aware of these developments. The Congress leaders have staged protest in Madhya Pradesh, against the step. But Hindu Mahasabha leaders are undeterred. They insist that Godse's role should be known to young generation. They claim that they wanted land and permission to build temple earlier. When the administration denied permission, the temple was built on the land of the Mahasabha office itself. The prayers and all the rituals are conducted.